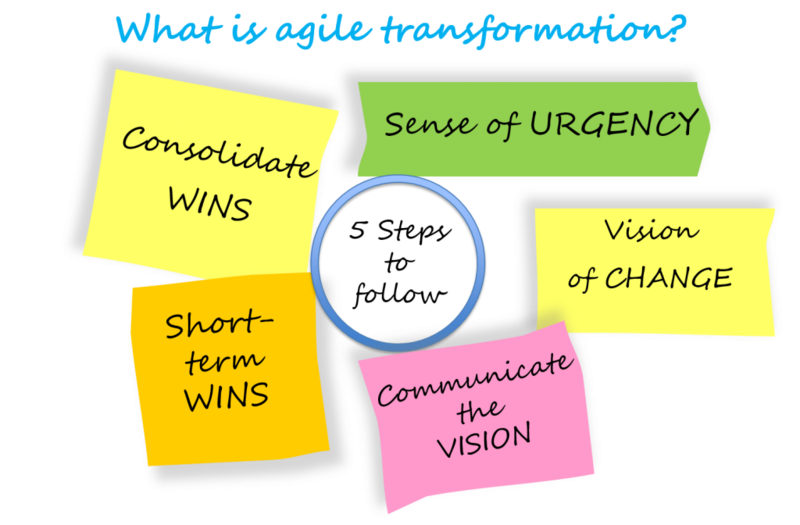 Agile is defined as the ability to move quickly and easily. Moving this concept into software development, Agile is the capacity to coordinate the project in order to increase the Return of Investment (ROI). Agile embraces changes based on frequent customer involvement, emphasising on the creation of a software deliverable by a small cross-functional team. When market is evolving and competitors are catching up fast, it’s time for you to change faster. Define and create a bunch of evidences and be able to communicate them. The important point is to create an urgency around why the change is needed. Establish a vision by asking how it will look like and what they want to achieve once they’ve gone through this change process. This will help to come up with the vision and create the strategy for achieving change. Evangelize the vision out by building exactly the required software without the waste. Reinforce that you’re actually achieving something. Remember that winning motivates people towards new wins, which makes the process go even better. Keep going, keep pushing and recognize the team that made the improvements by supporting the effort they made to make it possible and reinforce good behaviours they are doing. Contribution from José Manuel LOPEZ ALPANEZ.